When I first became vegan, I was concerned about missing two things. One, sort of obvious, was cheese. I mean, cheese is kind of magical. I had an obsession with string cheese. There were some days when my consumption would reach three sticks of cheese. I would buy these huge 48 packs of string cheese at the store and go through them quickly. String cheese was the perfect portable protein source (love alliteration!). It fit in a pocket, a purse, or a lunch bag. I also loved to eat queso Oaxaca, which is closely related to string cheese/mozzarella cheese, but slightly different. I first was introduced to it in Mexico, and found that you can buy it at any Mexican market here in the desert. Aside from those cheeses, I also occasionally enjoyed a nice creamy goat cheese. I guess my cheese love wasn’t wide, but it was deep. However, interestingly enough, I haven’t craved cheese at all since I stopped eating dairy. I also have absolutely no desire to try any of the vegan cheeses out there. Any cheese-like concoction that I can create at home is good enough for me, right now. So, this is to say, that while cheese may have seemed like my biggest “sacrifice” when going vegan, in all actuality, it was really pan dulce. The only times in four months that I have contemplated eating anything non-vegan were the occasional Friday afternoon as I was driving past the turn off to go to the panadería, or Monday mornings when I would go make photocopies at work, and be offered sweet pan dulce by the parents who volunteer at the school. Cheese, I have never craved. 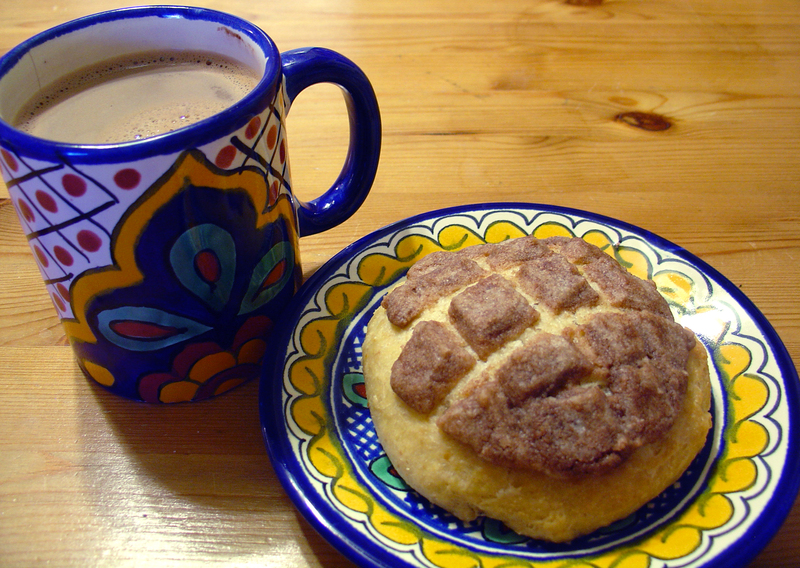 Pan dulce though, I’ve dreamed about. So, I went on a search for vegan pan dulce. No matter how I googled it, only one recipe appeared: Vegan Explosion’s Conchas. This recipe was posted way back in 2008, but both the recipe and the photographs looked great. So, I decided to give it a try. I was so excited to finally eat pan dulce, for the first time in six months, that I measured out the dry ingredients the night before, so I could get right to work with the mixing and rising and making and baking and eating the next morning. 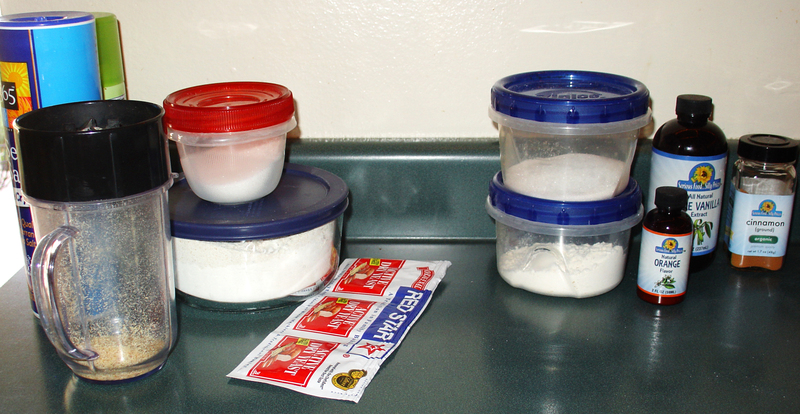 The ingredients on the left are for the dough, the ingredients on the right are for the topping. 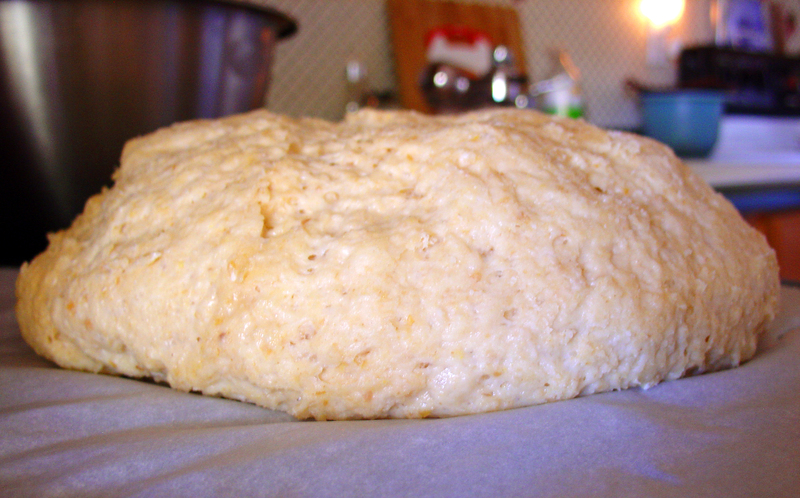 Then, I punched down the dough, kneaded it a tiny bit, and rolled it into 12 balls which I put on two parchment-lined baking sheets. Next, I prepared the topping. I divided each of the balls of topping into four tinier balls. The original recipe said to put each ball between two sheets of plastic wrap, roll them flat under the plastic wrap, and then drape them over the balls of dough. I, being too lazy to get out the plastic wrap and rolling pin, chose to just flatten each ball as best I could without having too much of the topping stick to my hands, and then draped these sort-of circles over the dough. It was messy, but it worked out okay. 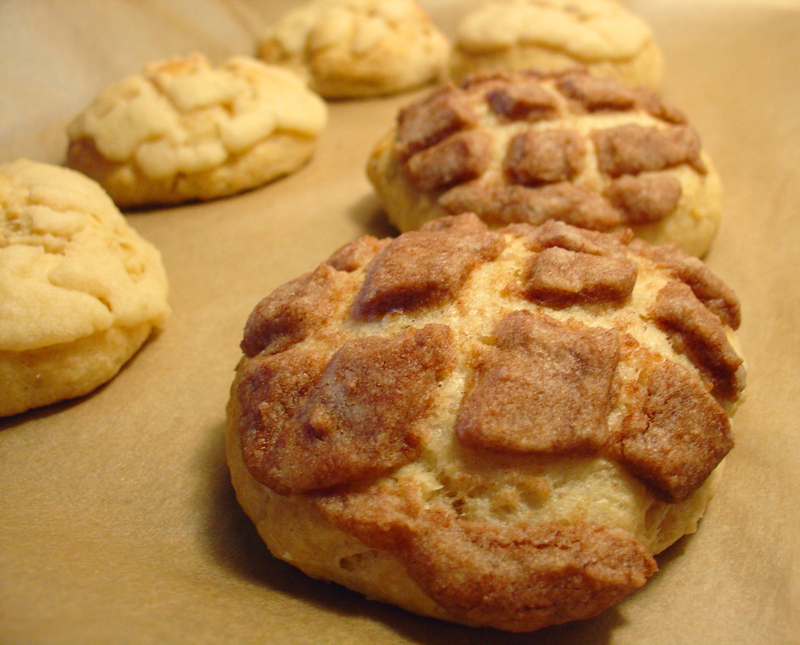 Finally, it was time to transform these from just balls of dough into real conchas. I carefully used a knife to cut a shell pattern into the topping. There are different ways to do it, but I just made three or four cuts in one direction, and then three or four more crossing over in the other direction. Really, you can make any design or pattern you want. I then covered the trays of dough and let them rise for another 40 minutes. 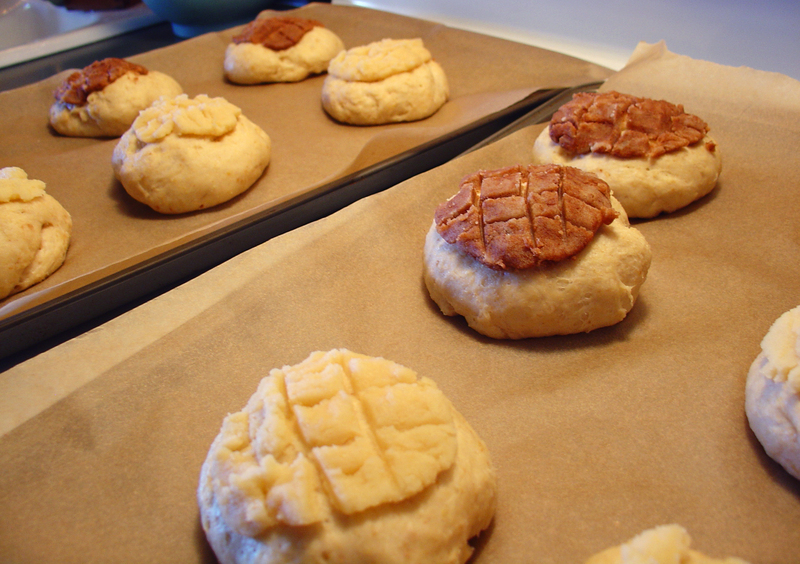 Pan dulce - risen and ready to go in the oven. Then, into the oven for 15-17 minutes (that’s what the recipe said to do, though I think I baked mine for more like 18-19 minutes). During these loonnnggg 15-17 minutes, I sat in my kitchen and smelled the delicious aroma of baking bread, cinnamon, orange, and vanilla. It’s almost as good as actually eating the conchas! Then, to pass the time, I took out a small pot and warm up some soymilk. In a mug, I mixed together a spoonful of unsweetened cocoa powder with an equal-sized spoonful of turbinado sugar and and the same amount of soymilk, to form a paste. Once the soymilk on the stove was warm, I poured it into the mug containing the chocolate paste, and mixed again until everything was well combined. By this time, the conchas were done. Cinnamon, vanilla, and orange conchas. First, before doing anything else, I just sat and admired them. They’re beautiful. And they smell wonderful. Then, I took one off the pan, put it on a plate, and sat down with my mug of hot chocolate. I took a bite. I sighed. I can continue being a vegan. As with everything else, these conchas are even more satisfying than the kind from a panadería, because I know exactly what went into them, and I did it all myself. And, they’re delicious. Hey! I can make that! I was at Trader Joe’s the other day and saw a container of edamame humus for sale. I looked at it, and looked at the ingredients: soy beans, lemon juice, oil, salt, garlic… My immediate reaction was that it looked delicious. My second reaction was to think about how I could make it on my own. About four years ago, I made my own hummus for the first time. I realized how easy it was, how much cheaper it is than buying tubs of over-priced (preservative-laden) hummus from the store, and how you could customize it to exactly the flavor you wanted. I’ve made roasted red pepper hummus, sun-dried tomato hummus, plain garlic/lemon hummus, and hummus with various curry and chile spices added. So, I set out to make my own edamame hummus. While I was letting my hummus cool down in the fridge, (I live in the desert. 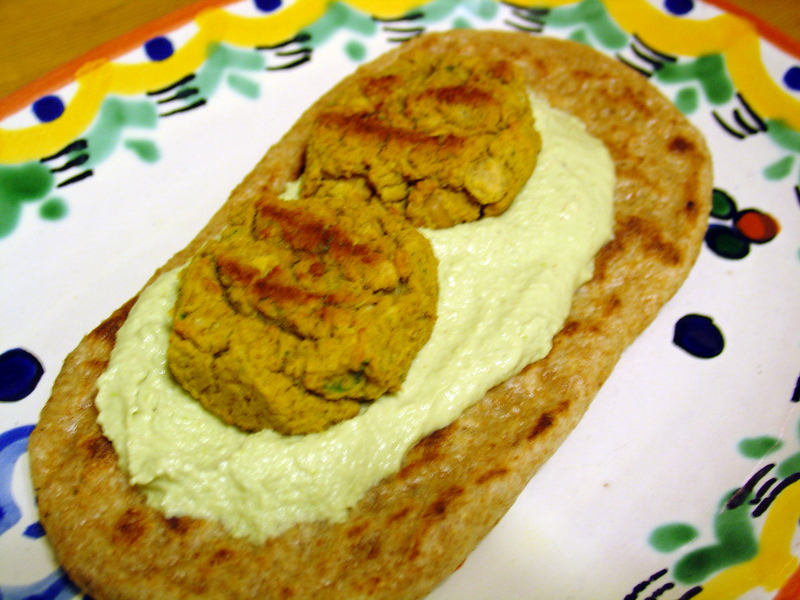 I wish I could cool down in the fridge, sometimes, too,) I decided to make some falafel! I used the recipe from Appetite for Reduction. I had a little trouble getting the garbanzos to blend in the Magic Bullet without added liquid (this is when a real food processor would have helped), but they eventually became mooshed enough. The recipe called for “2 tsp. hot sauce.” I wasn’t sure exactly what that meant, (what kind of hot sauce?) I ended up using Sriracha. I was afraid it would be too spicy, but it wasn’t bad. It was fairly spicy, but I love my food to be VERY spicy, so I enjoyed the extra kick. After the falafel was done baking, I assembled my dinner. Layer 1: Homemade (pocketless) whole wheat pita bread. Layer 2: Homemade edamame hummus. So, yes. I can, in fact, make that!